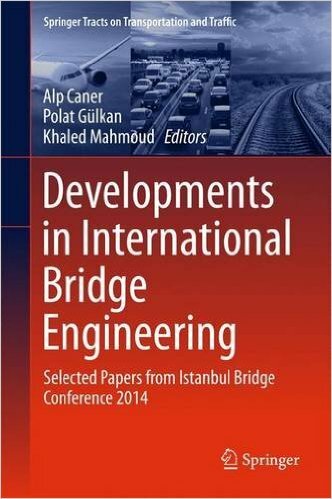 The book includes peer-reviewed contributions selected from presentations given at the Istanbul Bridge Conference 2014, held from August 11 – 13 in Istanbul, Turkey. It reports on the current challenges in bridge engineering faced by professionals around the globe, giving a special emphasis to recently developed techniques, innovations and opportunities. The book covers key topics in the field, including modeling and analysis methods; construction and erection techniques; design for extreme events and condition assessment and structural health monitoring. There is a balanced presentation of theory, research and practice. This book, which provides the readers with a comprehensive and timely reference guide on current practices in bridge engineering, is intended for professionals, academic researchers and students alike. Bridges are the lifeline links that enable the reliable transportation of goods and services that sustain communities and nations. They often represent large investments, and must overcome technical difficulties of design and construction. The attributes of good bridge engineering are manifested in economy, flair of esthetics and durable robustness. Unlike buildings where architectural considerations prevail, bridge engineering is usually the sole domain of the structural engineer. Over the last decade, significant bridges and their designs have challenged engineers all over the world with some built in Turkey. The Istanbul Bridge Conference 2014, bringing the global bridge engineering community together to discuss the latest developments in design, construction, maintenance and health monitoring of various types of bridges, has rightfully attracted a large number of practicing bridge engineers, academicians and manufacturers of bridge components from more than thirty-five different countries. The three-day conference promises to serve as a platform for debate, information exchange and an exciting experience for interaction among like-minded professionals, each with a different focus within the broad bridge engineering spectrum. It is of course emblematic that a bridge conference should be held in Istanbul, not only because it is a historic and ancient metropolis but also because it links the two shores belonging to two different continents along a narrow passageway that is already connected by two major suspension bridges with a third under construction, and two under-water passages for rail and highway traffic both of which will be completed shortly. The Turkish Association for Bridge and Structural Engineering is the principal host for the Conference. The Association has been founded in 1955 to promote high standards for every aspect of modern bridge engineering in the country. Since the beginning of its activities, it has also served as the Turkish Group for IABSE, but this conference is run solely under its own auspices. The Association has provided an elevated professional forum for the national as well as the global community of bridge engineers. By offering a variety of venues for communication, members of the group can exchange scholarly ideas and join in international discussions platforms. It has become one of the principal international platforms for bridge engineers to exchange latest technological innovations occurring within the global community. Though the Istanbul Bridge Conference 2014 has been organized mainly by The Turkish Association for Bridge and Structural Engineering it has received the support and sponsorship of many public and private entities in the country as shown in the Conference website. These are too many to name individually here. You will find our grateful acknowledgment for their contributions elsewhere in the Program and see them on numerous display booths. The papers presented during the conference can be found recorded in this electronic publication for you to share and spread to your own circle of friends and colleagues. A selected number of them will be published in book form Springer. This way we will facilitate the transmission of knowledge and help to develop new ideas for the next generation of engineers while focusing on current and future needs of the community.